rec. Hall One, The Sage, Gateshead, UK, 9-11 November 2009. DDD. I have yet to hear these performers in Concertos Nos. 24 and 25 (Avie AV2175), but, having greatly enjoyed the earlier recording of Piano Concertos Nos. 9 and 23 by the same forces, which I described as ‘almost mandatory’ (AV2100 – see review and my September 2009 Download Roundup), I was a little sniffy when I reviewed the download version of this in my January 2011 Download Roundup. The CD gives me the chance for second thoughts. I thought – and still think – the opening of No.22, placed first on the CD, a trifle overblown, almost Beethovenian. I was inclined to blame the eMusic download, offered in mp3 only and at a rather low bit-rate (224 kb/s), but the CD reproduces the same problem. I’m reluctant to blame the Avie recording when it’s otherwise so good, but the Northern Sinfonia can and does produce much more refined sound than this. Though described as a Sinfonia rather than a symphony orchestra, they are a little larger than we might normally expect of a chamber orchestra and it might have been wise to reduce their forces at times. In any case, the problem soon clears up, especially with the entry of the piano. I didn’t think the performance of the opening movement of No.22 as a whole quite up to the Imogen Cooper/Northern Sinfonia’s own standards, but that’s a pretty high bench-mark by which to judge. I soon came to feel that I could recommend this, like the earlier recording, as an ideal half-way house between full-blown period performance and larger-scale modern-instrument versions. Imogen Cooper’s playing, especially in the slow movements, has all the delicacy that one might reasonably expect of any performance, whether on a period fortepiano or a modern grand. The finale of No.22 goes with a real swing, so two very palpable hits and one very near miss isn’t at all bad. 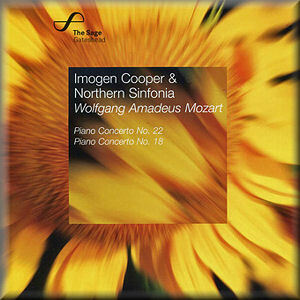 I’ve seen Cooper’s Mozart described as ‘upfront’, which certainly speaks to its strengths but ignores the delicacy. The vexed question, as always with one supremely good concerto and one which doesn’t quite match it – though we’d hail it as a masterpiece from any of Mozart’s contemporaries – is which to place first. I think I’d have opted to place No.18 first and leave the best till last, an arrangement which you can make for yourself, except that you may have noticed that the most expensive players don’t allow re-programming. No.18 is one of the must-haves of the earlier concertos, but it’s more lightweight and lacks the greatness of Nos.20 to 27, as is apparent from the outset in this recording. Cooper and her partners, however, make a very strong case for it, bringing out all its charm – I’d just have preferred to have had this played first. I thought the eMusic sound acceptable. Apart from the opening, the CD represents a small but significant improvement – a credible sound, reflecting the acoustic virtues of the hall, even in tutti. It comes, too, with the informative multi-lingual booklet, absent from the eMusic download but available with its classicsonline.com equivalent and also to subscribers to the Naxos Music Library. Competition is not as great in No.22 as in the other late Piano Concertos – it and No.21 are the major omissions from Clifford Curzon’s classic 2-CD Double Decca recording with István Kertesz (468 4912), and it’s similarly absent from the Stephen Kovacevich/Colin Davis set (currently unavailable) – so the new version must rank highly. Of versions which I have heard, I prefer it to the Barenboim recording on Warner Elatus. Jenö Jandó and Matyas Antal couple Nos.17 and 18 – perhaps a more apt pairing than on this Avie CD – on a very decent Naxos recording, an inexpensive version with which I’ve lived happily for a long time (8.550205). Cooper and her colleagues perhaps capture a little more in the slow movement and finale. This, then, is not quite the equal of its two excellent predecessors by these artists, but it is very enjoyable.